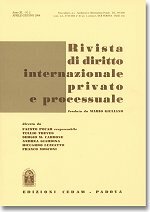 The second issue of 2013 of the Rivista di diritto internazionale privato e processuale (RDIPP, published by CEDAM) was just released. It features three articles and two comments. In her article Nerina Boschiero, Professor of International Law at the University of Milan, addresses the issue of “Corporate Responsibility in Transnational Human Rights Cases. The U.S. Supreme Court Decision in Kiobel v. Royal Dutch Petroleum” (in English). With a decision based upon the consideration that all the significant conduct occurred outside the territory of the United States, in Kiobel the U.S. Supreme Court unanimously ruled that the presumption against extraterritoriality applies to claims under the Alien Tort Statute, and that nothing in the statute refutes that presumption. However, in its decision the Supreme Court did not directly address the issue whether a corporation can be a proper defendant in a lawsuit under the ATS. In this article, the Author begins by providing a substantial “pre-Kiobel” analysis of the business-human rights relationship. Furthermore, in addressing – with reference to the Kiobel case – the issues of corporate liability and extraterritorial jurisdiction over abuses committed abroad, the Author provides a detailed description of the governments’ positions on universal civil jurisdiction, also providing a critical evaluation of the arguments put forth by the EU Member States on the extraterritorial application of ATS. As the Author illustrates, this decision is far more complex and problematic than it may appear: it in fact leaves a number of questions open on what exactly remains of the ATS, as well as various uncertainties due to the substantive differences between the majority opinion and the different concurring opinions, difficult to be reconciled and harmonized, especially from an European standpoint. In his article Andrea Bonomi, Professor of Comparative Law and Private international Law at the University of Lausanne, provides an assessment of the new EU Regulation on succession matters in “Il regolamento europeo sulle successioni” (The EU Regulation in Matters of Successions; in Italian). The European Regulation on Succession Matters, adopted on 4 July 2012, will be applicable from 17 August 2015 to the succession of persons who die on or after this date. The final text reflects in its main features the Commission proposal of 2010, albeit with several amendments. Among the most important novelties, we will mention the restructuring of the jurisdictional scheme, the introduction of an exception clause and of some specific provisions concerning wills and the formal validity of mortis causa provisions, as well as the admission of renvoi. Several useful clarifications have also been included, sometimes in the text of the Regulation and sometimes in the preamble, inter alia with respect to the definition of “court”, the determination of the last habitual residence of the deceased, the “acceptance” of evidentiary effects of authentic instruments, and the purpose and effects of the European Certificate of Succession. Overall, the Regulation is a very detailed and well-balanced instrument. In the majority of cases, the adoption of the habitual residence as the main criteria for the allocation of jurisdiction and the determination of the applicable law will allow national courts in the Member States to regulate the succession according to their domestic law. Derogations from this approach result in particular from the admission of party autonomy, and are mainly provided for estate planning purposes. The unification of the conflict of law rules in the Member States as well as the extension of the principle of mutual recognition to decisions and authentic instruments to succession law matters will also significantly contribute to legal certainty, and further estate planning. Last but not least, the European Certificate of Succession will greatly facilitate the transnational administration of estates by heirs and representatives. On the other hand, the main weaknesses of the new instruments concern the relationships with non-Member States, and with those Member States who are not subject to the Regulation (Denmark, Ireland, and the United Kingdom); potential conflicts with the courts of those States, due to the wide reach of the Regulation’s jurisdictional rules, cannot be avoided through lis pendens and recognition mechanisms. It is therefore to be hoped that the efforts of harmonization in the area of international succession will continue under the auspices of the Hague Convention at a global level. In her article Francesca C. Villata, Professor of International Law at the University of Milan, addresses the reorganisation of the Greek sovereign debt in “Remarks on the 2012 Greek Sovereign Debt Restructuring: Between Choice-Of-Law Agreements and New EU Rules on Derivative Instruments” (in English). The paper analyses – from a choice-of-law perspective – the restructuring mechanism implemented for the Greek sovereign debt bonds in 2012. In this respect, on one hand, the role played by parties’ autonomy in determining the law applicable both to contractual and to non-contractual matters is emphasised; on the other hand, an analysis of the relevant EU Regulations on CDSs and derivative instruments, as wells as of the Mi-FID II and MiFIR proposals is conducted mainly through the lens of unilateral mandatory rules following the lex mercatus approach. The paper concludes with an auspice for the adoption of uniform rules on the insolvency or pre-insolvency of states, providing for agreed-upon restructuring processes. Olivia Lopes Pegna, Researcher of International Law at the University of Florence, “L’interesse superiore del minore nel regolamento n. 2201/2003” (The Superior Interest of the Child in Regulation No 2201/2003; in Italian). The European Union is increasingly concerned with private international law instruments regarding, directly or indirectly, children. The UN Convention on the rights of the child (Art. 3) and the European Charter of Fundamental Rights (Art. 24) require that in all actions relating to children, whether taken by public authorities or private institutions, the child’s best interests be a primary consideration. It is therefore mandatory for EU Institutions, and for national judges, to construe and apply EU legislative instruments in compliance with this principle. The present work concerns rules on jurisdiction and enforcement of foreign judgments that expressly refer to the best interests of the child in order to operate, and in particular the rules set in Regulation No 2201/2003 (Brussels II-bis) concerning decisions on parental responsibility. It tries to show how, and to what extent, “the best interests of the child” principle introduce flexibility, or even derogate, to the traditional private international law methods. The case-law of the European Court of Justice on the Brussels II-bis Regulation is examined, together with the main decisions of the Italian courts, in order to evaluate to what extent effectiveness to the aforementioned principle is guaranteed in the application of the Regulation’s provisions. It is also suggested that the Regulation shall be construed in a way that permits, in some circumstances, the participation of the child to the proceedings for recognition and enforcement of foreign decisions. Nicolò Nisi (PhD candidate at the Bocconi University), “La giurisdizione in materia di responsabilità delle agenzie di rating alla luce del regolamento Bruxelles I” (Jurisdiction over the Liability of Rating Agencies under the Brussels I Regulation; in Italian). A recent judgment delivered by the Italian Supreme Court decided upon the jurisdiction over damage claims brought by investors against rating agencies based in the U.S., allegedly liable for issuing inaccurate ratings capable of having a significant impact on their investment decisions. In this regard, the new Regulation (EU) No 462/2013 amending Regulation (EC) No 1060/2009 on credit rating agencies has introduced a new Article 35-bis specifically addressing the liability of rating agencies but it failed to provide some guidance with respect to private international law issues. The Italian Supreme Court declined its jurisdiction on the grounds of Article 5(3) of Regulation (EC) No 44/2001 (“Brussels I”) and ruled that the “place where the harmful event occurred” is localized at the place of the initial damage, i.e. where the shares were first purchased at an excessive price, without any reference to the seat of the depositary bank, nor to the place where the rating is issued. This judgment turned out to be very interesting since it was the first Italian judgment to deal with jurisdiction issues relating to liability of rating agencies under the Brussels I Regulation and it provided for the opportunity to make a contribution to the discussion on the interpretation of Article 5(3) in case of financial torts and purely financial losses.